Navabi have a new collection, it's a collection of seasonal pieces ranging from a size 14 to 28. Luxurious fabrics like chiffon & leather and lots of warmth in the colour palette; offering some of my fave autumnal shades like mustard and wine. The black leather jacket is such a beautifully feminine cut, I couldn't stop gawking at it but when I saw it retailed at over £300 my heart sank, I just couldn't afford it. I vow that if I ever came into a sudden windfall, it will be one of my first purchases. If you cannot wait - then you will be super pleased to know that it's currently on sale reduced from £344.50 down to £244.00. Grab it while it's on offer! The ponte jersey dress was very kindly gifted to me from Navabi. This truly is a beautiful dress. I have worn it a few times so far to events and work, it's so versatile. It could quite easily be dressed up for a night out as well as a perfect daytime outfit. I ordered a size 20 and I could have potentially sized down on this item as it was quite loose. I usually sit smack bang in the middle of an 18 & 20 size wise, so if you too are between sizes, perhaps go for the lower size if you would prefer a more fitted fit. 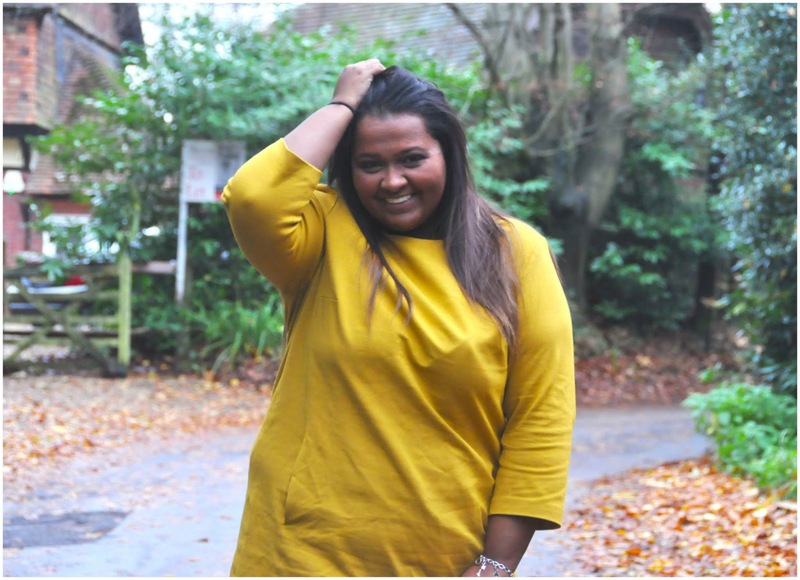 The mustard colour is one of my favourite autumn shades. It's so vibrant and warm, it really adds a little flavour into the dreary days. The quality of the Ponte Jersey fabric is lovely and thick. It's warm enough to wear without the need of an extra layer. The sleeves; 3/4 length. The dress has one pocket, with two openings either side (you know me - this is a major selling point from me) There's a full zip at the back. The neck is quite wide and almost a slash neck. 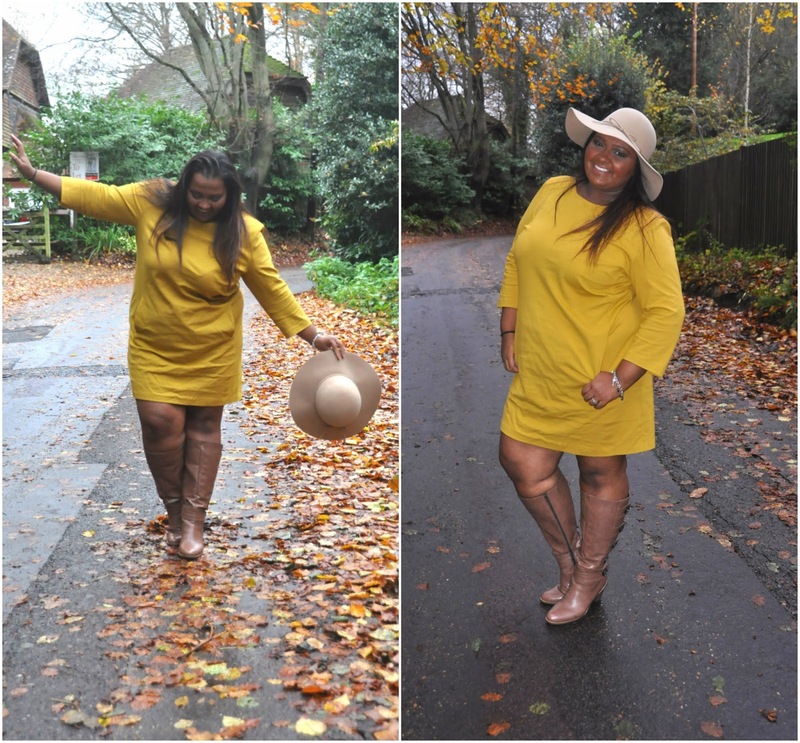 I teamed this with a light tan wide brim hat which I picked up for £3 from a charity shop and these gorgeous extra wide calf fit heeled boots from Simply Be. This dress is currently on sale online reduced from £126.00 to £114.50. Overall Summary: I am eager to try more pieces of the new collection just wish that my wallet was unlimited! I love the colour and style of this dress. I can't really find any fault in it. Potential improvements: I have no recommendations for improvements on this dress. Would I recommend this? 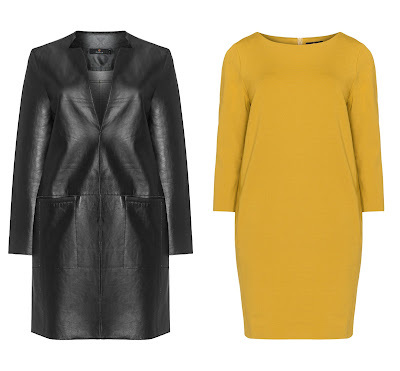 YES if you are prepared to pay for quality then Navabi have exactly what you are looking for. Everything from the material to the quality of the garment justifies it's price. Do not be put off by price tags - invest in fabulous quality that will last. This item was gifted to me for review purposes. The review above is based on my own opinions of the products and I own all creative content of this post.